Powers/Abilities: None. Hu Sak was the military commander of Communist guerrilla fighters. He was armed with a .45 caliber pistol. History: (Journey into Mystery I#117/1 (fb) BTS) - Years earlier, Hu Sak left his family and, unbeknownst to them, he joined with Communist guerrillas and became a commander. (Journey into Mystery I#117/1 - BTS) - Following the so-called "Trial of the Gods," Loki hid enchanted Norn Stones in the underground ammo dump used by the forces of Hu Sak. (Journey into Mystery I#117/1) - In search of the Norn Stones, Thor used his hammer and tracked them to Vietnam, but as he flew through the sky, he was hit by an artillary barrage from Hu Sak's armed forces and rendered unconscious. Thor was later found by Cho, Kim, and their mother, and taken back to their hut to recover. Upon awakening, Thor resumed his search for the stones. When his costume became entangled in the jungle underbrush, the thunder god transformed himself into his mortal identity of Don Blake, whose smaller frame made it easier to travel through the jungle foliage unfettered. 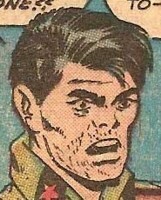 But Blake was captured by a band of guerrillas who hid in underground tunnels and was taken to their leader, Hu Sak. Thinking Blake to be a spy, Hu Sak interogated him; when he couldn't get the answers he wanted, he had his men bring in the latest batch of hostages for him to threaten with death, to coerce Blake into talking. 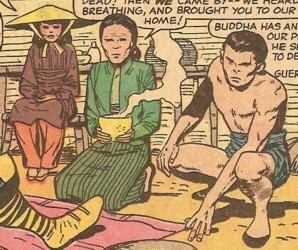 But when the hostages were brought before him, Hu Sak was surprised to see that they were his own mother and siblings! This distraction allowed Blake to run off and transform back into Thor. Upon learning that Hu Sak now served Communism, Cho disowned his brother, and his mother told Hu Sak that he had brought shame to them. In blind rage, Hu Sak pulled his handgun and fired several times at Cho, while his mother jumped in the path of the bullets to save her son, but both were killed. Horrified at these events, Kim ran off screaming, calling Hu Sak a murderer. Upon recovering the Norn Stones, Thor flew Kim off to safety. When he came to his senses, Hu Sak was distraught and riddled with guilt over what he did in his fit of anger. Blaming Communism for shaping him into a brutal, unthinking instrument of destruction, and causing him to bring death to his family and dishonor to his name, Hu Sak decided to face his fate like a soldier. He pointed his gun at the cache of artillary shells stored in the underground bunker and fired, killing himself in the resulting explosion. His final thoughts on Communism: "...may it vanish from the face of the earth and the memory of mankind!" This story was published in 1965, during the Vietnam war, but that can probably be considered a topical reference -- so this story probably just took place in the generic "southeast Asia". Hu Sak had left them years earlier to join the Communists. Kim would labor in the fields, while Cho would help to protect her and the other farmers of the village from the Communist guerrillas with his rifle. Finding the unconscious Thor, the family thought him to be an omen from their god, so they brought him back to their hut to recover. Upon seeing the famine and the poverty that had struck their village because of the Communist guerrillas, Thor vowed that he would aid them in fighting the tyrants after finding the Norn Stones. But the Communists had seen the family giving aid and comfort to the thunder god, so they were abducted and taken to an underground ammo dump used by their estranged family member, Hu Sak. In a fit of rage, Hu Sak shot Cho and his own mother, but after seeing the shame he had brought upon himself by killing his mother and brother, Hu Sak commited suicide by blowing up the ammo dump. Kim was flown to safety by Thor and left in the care of American soldiers patrolling the area in a helicopter. 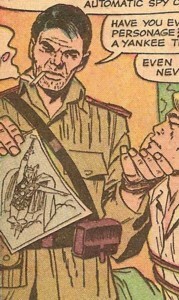 Loyal to Hu Sak and the Communist cause, they captured Don Blake in the jungle when he (as Thor) was searching for the missing Norn Stones.